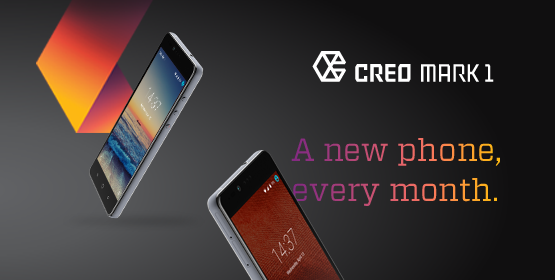 An Indian Startup Named CREO, the company which created Teewe HDMI streaming Dongle like Chromecast, has announced that there upcoming MARK 1 smartphone will get feature monthly updates which they are dubing as "A new phone, every month". The Mark 1 has similar design like many smartphones in the market. Curved metallic rim and slim glass back and nearly the size of iPhone 6S Plus. CREO has committed to providing "BREAKTHROUGH" feature to the Mark 1 every month, rather than high-end specs or price. "We at CREO put users at the centre of our monthly update model. These updates will bring powerful features which are not present on Android currently" Sai Srinivas, Co-Founder and CEO told Gadget 360. These features will be based on suggestions and feedback from CREO community. The CREO will collect the suggestions and feedback and plan out the feasibility. So this makes this Indian startup a bit out the box. Seems NextBit has got a competition. Srinivas also said that they will be focused on Android OS level features. So far the features are concerned we only have information the Android OS will be based on Android Lollipop 5.1.1 and design as said above. So what do you think about the device will it mark it's place in the Market, comment and share.